US 422 Westbound at SR 2041 just E of Baumstown: US 422 eastbound at Baumstown Union Sunday School. Of sturdy Quaker stock, Daniel Boone was born in the Oley Valley of present-day Berks County, just a few miles from the Schuylkill River and some fifty miles from Philadelphia. When Daniel was ten, his father bought twenty acres of land some distance from the farm to graze the family cattle. Too far to walk in a day, Daniel and his mother lived there in a small cabin during grazing season. For the next six years he tended cattle and roamed the woods, honing his hunting and tracking skills. By the age of ten, he had become skilled with a herdsman's club that he used to kill birds and small game. After Daniel's father gave him his first gun when he was about twelve, he neglected his farm chores to go hunting in the woods. The forests of the Oley Valley were filled with game, including deer, turkey and bear. In the forests of half-settled Berks County he honed his skills as a tracker and marksman. When Boone was fifteen, his family moved to North Carolina. It would be the first of many moves that would take him into the wilds of Kentucky, Florida and Missouri. Boone may have been seeking good land for farming and sale, but he made his living as a hunter and trapper, trading in the skins of deer, bear, and otter. He might have remained unknown had he not had a chance encounter with Kentucky land speculator John Filson. 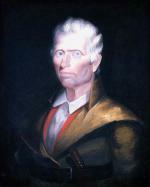 A former schoolteacher from Pennsylvania, Filson published Life and Adventures of Col. Daniel Boon, [sic] in 1784, a romanticized biography that portrayed Boone as the heroic colonizer of the Kentucky wilderness. A generation later, novelist James Fenimore Cooper would use Boone as the model for Natty Bumppo, the great hero of The Last of the Mohicans and other novels. 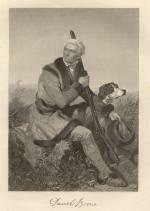 For generations to come, Daniel Boone was one of America's great role models, an enduring symbol of the bold American hunter, trailblazer and Indian fighter. He was, according to President Theodore Roosevelt, himself an avid outdoorsman, "the solitude loving hunter, dauntless and self-reliant;" a man at home in the "lonely life of the wilderness with its bold, wild freedom, the only existence for which he really cared." Searching for a place where the land was rich and where a man might hunt and live at ease, Boone hunted and trapped into his seventies. For the sheer love of the chase, Boone would sometimes spend a whole day hunting deer. Two types of deer roamed the Pennsylvania forests of old: the white-tailed, or "little deer" (Odocoileus virginianus) in the south, and the great Pennsylvania Hart or "big deer" (Odocoileus americanus borealis) found in the northern mountains. More like the elk or caribou than the modern white tail deer, the Pennsylvania Hart ran in great herds of 500 or more, led by a magnificent stag – some weighing more than 300 pounds – and younger stags or "satellites" that hovered around the edges. For more than a century, Pennsylvania's hunters slaughtered them, often in bloody drives, circling a wide area, then killing whatever moved as they closed in. Once the big herds were gone, hunters staked out deer licks, used torches to blind them at night, ran them with dogs and hunted them to near extinction for their skins and meat. When the Hart were gone they pursued the white tail, hunting them to the point of extinction. By the time Boone died in 1820, the forests around his Berks County homestead had been hunted clean. Gone were the panther and the wolf, the passenger pigeon and the bear, the Big Deer and the Elk that he loved so dearly. By the end of the century, they would be gone from all of the forests of the great state of Pennsylvania. John Mack Faragher, Daniel Boone: The Life and Legend of an American Pioneer (New York: Henry Holt), 1992. Mike Sajna, Buck Fever: The Deer Hunting Tradition in Pennsylvania (Pittsburgh, PA: University of Pittsburgh Press), 1990. Henry W. Shoemaker, Pennsylvania Deer and their Horns (Reading, PA: Faust Publishing Co.), 1915.